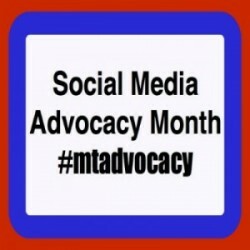 Happy Social Media Advocacy Month! This year, the theme for Social Media Advocacy Month is connection. I have the privilege of working in a preschool early intervention program and charter school for children with special needs, Early Beginnings Academy (part of UCP Miami). At Early Beginnings, I co-treat with occupational therapy (OT), physical therapy (PT) and speech therapy (ST). Each time I co-treat a connection is formed, bridging music therapy to the other disciplines. 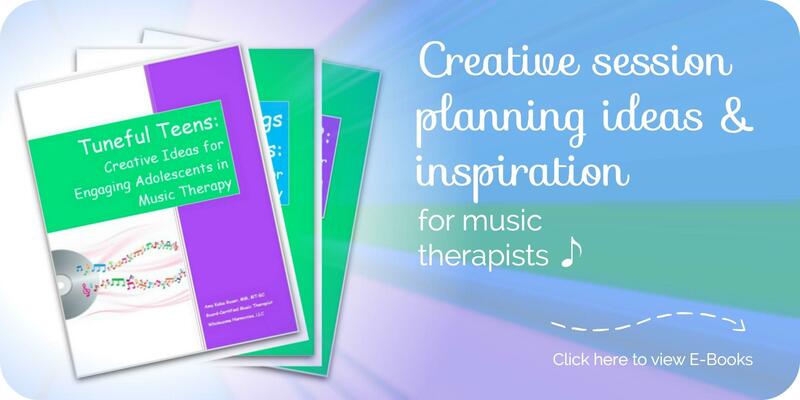 These co-treatments allow me to see how how these disciplines can inform our practice as music therapists and provide us with sound ideas, but they also allow me to see how music therapy can truly support OT/PT/ST activities. Last year I took part in a music therapy/OT co-treatment with two boys with Autism Spectrum Disorder. The OT showed me one of the experiences she often uses with her children with ASD – jumping on the trampoline and then “crashing” onto a water bed. This activity is used to provide kinesthetic and proprioceptive input for children who are sensory-seeking. I observed her facilitating this activity and brainstormed how I could “add” music to the mix. In this experience, music could function as an organizer for the activity AND I could use certain musical elements to cue the child’s behavior. When I jumped in we had the child stand up on the trampoline and wait for me. I strummed a slow V7 chord (a dominant chord filled with anticipation) as I sang “Aaaaaand….” Then moved to the I chord as I sang “Go!! I want to jump, jump, jump, up and down! I want to jump, jump, jump, up and down.” While singing this, I played a steady, rhythmic slap strum to cue the movement of jumping up and down. Then I strummed the V7 chord again slowly while singing “Aaaaaand crash! !” That was the child’s cue to take their last jump on the trampoline and “crash” on to the water bed. The musical form provides clear structure to organize this experience. (The child knows they will jump for the whole first verse…and then it will be time to crash). The V7 chord cues the child to start jumping and cues the child to crash. The lyrics cue each different movement (jump, crash). The rhythmic beat provides organization and grounds the experience, and the tempo tells the child how fast to be jumping. All these musical elements work together to create an experience that is appropriate for the child and one that is clear even without verbal cueing: the music does the cueing! I have also participated in a music therapy/ST co-treatment where we used a modified version of Rhythmic Speech Cueing to facilitate the child speaking in a complete sentence. 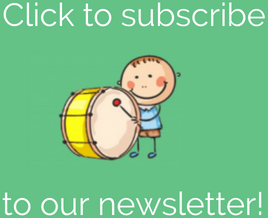 We hit the drum one time for each word in the sentence: “My name is Amy.” Hitting the drum one time for each word ensures that the child clearly speaks each word in the sentence (rather than saying “My name Amy” – sometimes it’s easy to leave out “is”!). The motor movement (playing the drum) also serves to cue the speech output (singing/speaking the sentence). You can watch this video here! I have also modified this activity during music therapy/ST co-treatments to work on clear articulation of each syllable in a given word. The child would be instructed to hit the drum one time for each syllable of the word “hi-ppo-po-ta-mus” for example. These examples are some of my favorites to use when telling others about the connection between music therapy and other therapeutic disciplines. Just as OTs, PTs, and SLPs give us ideas for activities and goals in their discipline, we as music therapists can demonstrate how music can structure and organize an experience. We can also show how specific musical elements can cue behaviors and speech output. Working together with shared goals in mind improves our skills as clinicians and improves the experience and outcome for the children with whom we work.